The Rail is Jimmy’s favourite down-wind shape after testing many different prototypes on the famous Maliko run on Maui. Available in 100% carbon for maximum performance, or Classic construction. The bottom shape is a subtle double concave, leading to a slight vee in the tail. Jimmy has spent a lot of time getting the rocker just right, so that it’s fast, but won’t pearl or stick. It is one of the smoothest riding downwind boards ever designed! After a lot of testing in Canadian waters, we’re happy to announce that this is one fast board, even on flat water and will keep up to all but the very fastest flat water race boards. It’s a great one-board quiver — if you want one board that can handle whatever conditions you throw at, it’s the one! Which width? The wider 28″ version is very stable and will catch smaller waves easier due to the added surface area. 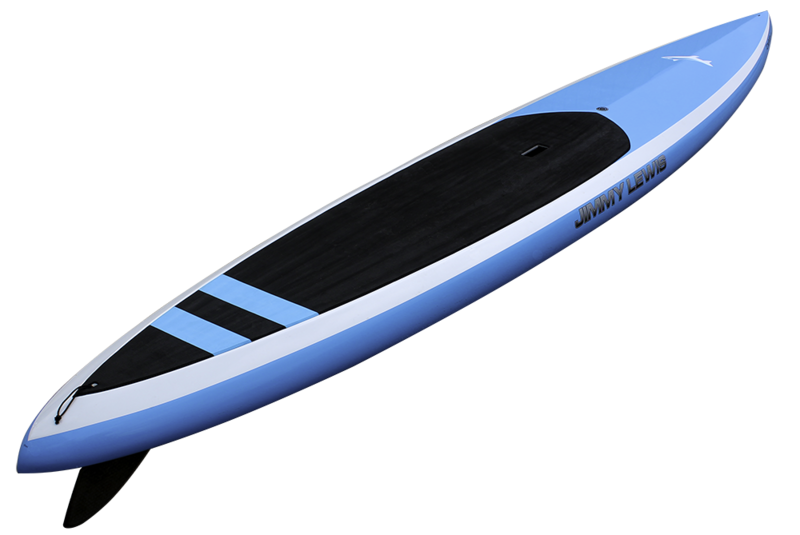 The narrower 26.5″ shape is faster on flat water, but is still much more stable than the width would suggest, and is the choice for experienced paddlers. Volume 28″: 290 liters Weight Carbon: 10.98 kg (24.2 lbs) with fin. This board is my new favourite all-round shape because it can handle any conditions you throw at it. Waves? No problem — she catches waves as little as a foot high. Flat water? It’s surprisingly fast due to the length and narrow outline. Don’t let the narrow width fool you – this board is very stable in all conditions, even for beginners. You can stand with your heels just forward of the handle cutout in flat water, then move back as you catch the bumps. On flat water, balance the board so the tail is just slightly off the water for maximum speed. Did I mention that I absolutely love everything about this shape? You can stare at her gorgious lines for hours – she’s truly a thing of beauty. Only Jimmy Lewis designs such purely beautiful boards.